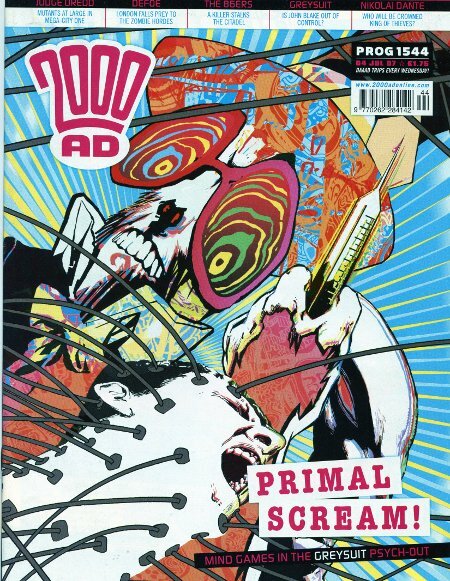 June 2007: A very, very short (time-sensitive) entry this week, to acknowledge that this was the neat little point where Pat Mills got to launch two brand-new series in the same week. Defoe, illustrated by Leigh Gallagher, is the more successful of the two. It really goes over very well with the readership and features the great Mills standard of throwing an incredible amount of ideas and information at you and seeing what sticks. 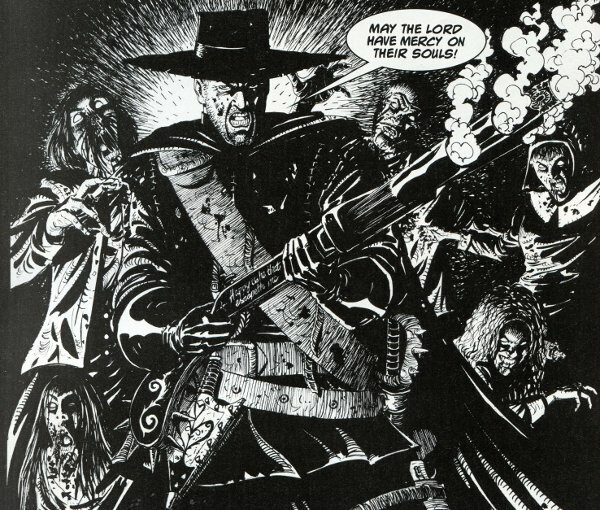 It's set in 1668, two years after a comet has reanimated the dead, and our hero is the tough-as-nails Titus Defoe, saving the city of London from an army of "reeks" - the word "zombie" hadn't entered our lexicon in the 17th Century, of course - who are shown to be under the control of a fantastic general. In a fantastic sequence, the master villain of this story is the decapitated head of Oliver Cromwell, used by the reek army to interrupt the king's privacy by being mounted on a long pole and banged against the window of his majesty's bedchamber. This first adventure is pretty straightforward, although Mills really introduces a heck of a lot of characters, backstory and wild, weird weaponry. Sir Isaac Newton has been outfitting the good guys with all sorts of cool guns, tanks, and ornithopters, while conducting strange and ungodly experiments with reeks to find out what's causing their rampage. Newton might be the only historical figure to feature as a supporting player in two 2000 AD series at the same time. Both here and in The Red Seas, he's depicted, not without good reason, as one of the smartest men in England. Over the course of the first four stories, Defoe picks up a pretty huge supporting cast - honestly, having some short sidebar stories digging into their backgrounds would help enormously - and a much broader range of bad guys as the extent of the villainy is shown to be infecting much of Europe as well. Rumor has it that a fifth Defoe story is expected in 2013. On the other hand, no more Greysuit is presently expected. It's a much more straightforward adventure, with far less of the backstory that informs Defoe. It begins as a a slight revamping of the popular 1977-78 series MACH One, only this time around, it's influenced more by Jason Bourne than by the Six Million Dollar Man. 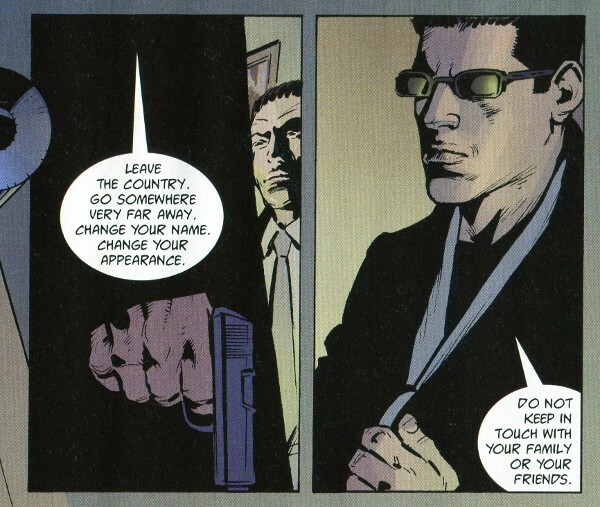 The hero is John Blake - initials probably not a coincidence - and he's a Delta-Class assassin for the British government. He's been given superhuman strength and reaction speed, as have a few other people in his department. Delta agents are programmed to obey their orders, but Blake has a soft spot for children. He's ordered to kill three bank robbers, but one of them bargains for his life with evidence that a top government official is involved in a child slavery ring. Blake goes out on his own to avenge the crimes, and is, literally, busting heads across Europe. One thing that really makes Greysuit stand out is the remarkable, visceral violence. John Higgins gets to draw some unbelievable brutality. When Blake uses his super-strength on somebody, he shatters their skull, jawbones and teeth flying free in the goriest way. There are only two Greysuit stories. We'll have to come back to the negative reaction to the second adventure some other time. Speaking of negative reaction, we'll be back in seven days not to bury Samantha Slade on the occasion of her final adventure, but to praise her. See you in a week!